Organizations, Artifacts and Practices (OAP) yearly workshops remind of the fact that work in organizations happens in certain physical spaces, need certain time and is performed with the help of artifacts – even in the digital age. 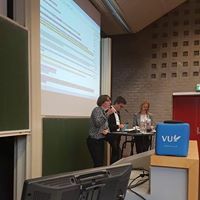 The theme for this year’s conference was ”Rematerializing organizations in the digital age” An overarching theme in the sessions I attended was places where we work – working from home or working in open space offices, especially hot-desking, i.e. not having a designated desk. Timon Beyes’s opening keynote on ”The work of disconnection” discussed the increasing trend of learning to disconnect from the digital world – for example digital detoxes. His descriptions of how digital media has invaded our ways of thinking even when we try to disconnect was quite thought-provoking. The occasional giggle in the audience indicated that we to a certain extent recognised ourselves in the descriptions. In the final panel the three days’ presentations on locations and open office spaces were summed up, and, generally, open offices were criticised on basis of many surveys and interview studies, some of them done in universities. The lack of privacy was acutely felt. In the overall effort of creating open offices, even people with functions the really demand private spaces (counselling, for example) found it difficult to assert their needs, as in Bernadette Nooij’s study. Identity crises – “who am I without my books”, as a university staff asked. And, actually, some people felt more lonely, when chatting at the door of a colleague was no longer possible. As Marie Hasbi has found out, there can be gender issues – not only had female workers problems in finding a space for their handbags (the lockers relatively far away, and nowhere to lock away the handbag when moving from the desk), the acts to re-territorialise desks could have gender aspects, as well as being exposed to all colleagues all the time. And the negatives seemed to persist. Increased working from home often goes hand-in hand with hot-desking (so the number of desks can be kept lower than the number of employees). Melanie Goisauf had studied a well functioning public bureaucracy, where working from home was introduced and found out that control of the employees by the managers increased when the team control, built on common ethos and responsibility and supported by daily interaction diminished. Instead of “us” having responsibility towards the public, single employees shifted their responsibility towards the management, and the team spirit deteriorated as competition regarding individual performance increased. As managerial control based on performance measures increased, tacit knowledge disappeared from managers’ view. Joshua Firth’s study from New Zealand at an ICT development company, developing tools for healthcare goes in line with the HTO results: Practitioners/healthcare workers find it difficult to really get a voice in development processes, even if they would be formally enlisted, and this trend seems to get stronger the longer the process goes on. Firth talked of building in neotaylorism in the healthcare software, and just like Taylorism in its time, it profoundly changes work practices, disempowers the (healthcare) workers and centralises managerial power. Also Joao Cunha’s study on how people enlist other people’s help when they have to use online communication is interesting in healthcare, where more and more communication is supposed to use electronic forms instead of personal interaction. Cunha found that when people just have to send a message to a great unknown, and, thus positional power or personal relationships cannot ensure that their request will be heard, they invent different strategies in trying to ensure that the request is dealt with swiftly. The workshop made great efforts for breaking up traditional academic lecturing styles with a number of panels and question-answer sessions. In this context Vrije Universiteit Amsterdam had an artefact I haven’t encountered before: A conference microphone shaped like a soft cube (see image). Instead of people running around with microphones, the “dice” was thrown around in the lecture hall. Fun – but also demanding that the person who had something to say had a fair ball sense to be able to catch and throw precisely enough. Still another academic ability coming on?